I’m always sticking flowers in jars, which make great vases. That is unless you have the kind of flowers that don’t stay standing upright or enough of them to wedge into the jar so they stay and look just how you’d hoped. Use this trick that I know I didn’t invent, but have no credit beyond necessity during a demo at the Union Square Greenmarket a few months ago when I was presented with lovely spring tulips, a notoriously fragile and support-needed kind of flower. 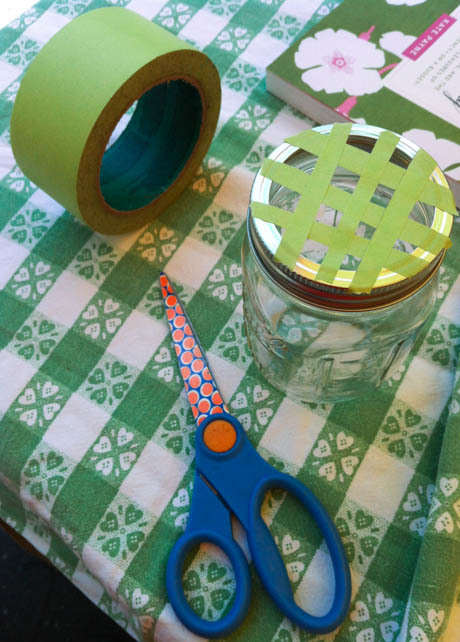 Make a grid out of masking tape that will disappear as you populate it with different sorts of flowers. The grid also lets you work in taller flowers that would otherwise fall over. If you use the mason jar band as the base from which you start taping, you can remove it and re-use it for future arrangements.